I’ve loved this since I stumbled across a recipe for it at RecipeGirl.com(http://www.recipegirl.com/2012/01/16/cauliflower-crust-hawaiian-pizza/). It sounds odd and if you don’t like cauliflower then you’ll be forgiven for assuming it has must be dire. My sons refuse to believe it could be edible, but I can assure you it is wonderful and well worth trying, the resulting base is so far away from being like the stewed tasteless cauliflower I remember from my school days. Actually thinking back to school meals I’m always surprised I ever came round to food at all, everything always seemed so gross. Anyway back to the pizza. The finished thing looks like pizza and tastes wonderful, while it doesn’t taste like a bread base it is really good and it doesn’t taste like you’d imagine it would either! You don’t feel stuffed when you’ve finished eating but you are nicely satisfied. The only thing you can’t do with it is pick it up in your hands to munch it like you would a normal bread based pizza, you’ll need to eat this one with a knife and fork. The first time we made it Gary grated the cauliflower by hand, this takes forever and can be painful, I’d recommend using a food processor if you have one. For the crust I’ve so far used cheddar and mozzarella and they both work really well. I think the crust could work well as the base for a gluten-free quiche that is quite delightful without leaving you feeling overly stuffed afterwards. I’ve not tried this out yet but I think I will soon so that may figure on the blog shortly. This is really down to personal choice, so far we’ve enjoyed ham and pineapple, salami with mozzarella and olives, all on top of a nice home-made tomato sauce. Start with your cauliflower and chop it up into individual florets. Then either grate it (I don’t recommend this route) or pulse it in a food processor until it’s in tiny pieces and looks a bit like rice. You want small grains of cauliflower though and not a puree, a puree won’t work so well. Put your processed cauliflower into a microwave safe bowl and microwave it for 8 minutes. I hate using the microwave at all but this works so … I go with what it says to do. Let the cauliflower grains cool and then mix up well with the other crust ingredients. Grease an oven tray or pizza stone and shape the crust mixture into a round flattening it out carefully, so it has a traditional pizza shape to it. Brush the top gently with olive oil. Pop your pizza into the baking oven of the AGA for about 15 minutes. I think this equates to about 450 degrees in a conventional oven. If you’ve oiled the top it should begin to brown nicely. At this point its time to add your topping of choice, before topping with cheese and putting it back in the oven to finish off for approximately five minutes. Enjoy with salad and a nice glass of wine! We find this makes one large pizza which we often don’t finish in one sitting. With plenty of salad it could do four people, or two very hungry ones. 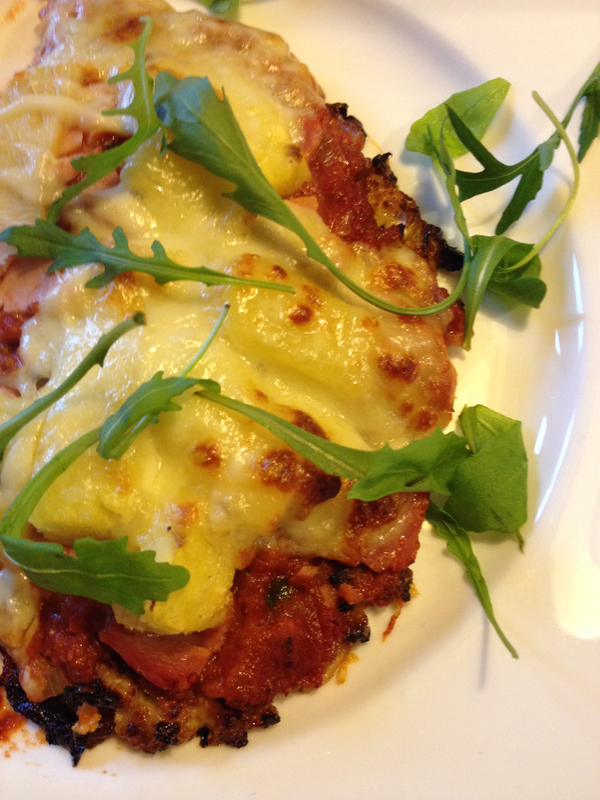 This entry was posted in Meals, Uncategorized and tagged Cauliflower, Gluten Free, Pizza on September 29, 2014 by Sue Todd.